The Yes Eleanor-12 has an interesting hollowed-out design - almost like a Ping Anser putter with a curved back bolted onto it and nothing in between. My feeling is that this is going to be a "love-it" or "hate-it" design. Not being a fan of hollow putters put it in the latter category for me. That having been said, the shape does offer one advantage that I liked. When you address the ball, you get a feeling that you're lining the putt up from two points. Firstly from the center of the curved back of the putter and then the T shape lines on the top of the putter. Because you're lining these two points up at the target, it almost feels like you're lining up a bow and arrow or a shot at pool. You get a real sense of where the putter is lined up from this. I also liked the fact that so much weight of the putter is high up off the green - right behind the center of the ball. This gives you the feeling that you'll get a great roll before you even take the putter back. This was a big surprise for me - normally hollow putters have a dreadful feel and make a high pitched tinny sound, but the Yes Eleanor-12 is different. The strike feels good and you don't get this with too many futuristic putter designs such as this. The putter is much lighter than its size suggested it would be, however, and with such a big head, I would have expected a more meaty feel to the clubhead. The hugely impressive Yes C-Groove face design takes care of the roll well from this putter and the ball comes off it with a beautiful end-over-end roll. Unfortunately, for whatever reason, the dispersal of balls from the face of the Yes Eleanor-12 during my test was far greater than I would have expected and this would make me wary of buying one. 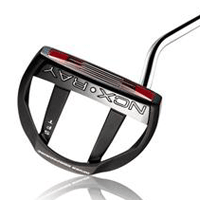 The looks are likely to be your biggest sticking point with this putter. If you like them, great, if not, then don't bother buying.